Since the procedural planets don't generate above Jupiter size or mass (I've seen a few that were a little bit more massive than Jupiter, but nothing more massive than 2 jupiters), I looked at the catalog planets (used the Kepler app to find them). These two are the most massive that I could find, they're more like extremely dense Jupiters though. Or maybe they are actually brown dwarfs. Of the confirmed planets, there actually is one that is more massive, but the mass is completely different in SE. This one is a little bigger than HAT-P-32 b, but I'll admit that HAT-P-32 b is more photogenic anyway. You can if you export the planet's code and look at the script. Or if you just fly to the edge of the rings and look at the distance to the planet. I don't have the location anymore, so I can't check. Also, it actually had a moon right on the edge of it. Hmm it appears you're right. This is odd, I recall that the engine used to generate more massive planets. Alnitak 4 is 7.4 Jupiter masses, Saiph 4 is 6.9 Jupiter masses, HD 41161 3 is 10.3 Jupiter masses, RS 8403-425-0-0-0 6 is 5 Jupiter masses, RS 8403-175-0-0-0 2 is 6.3 Jupiter masses, so they do generate. However, their suns are all huge blue stars, so I think the big ones may only generate around huge stars. Well, I was looking at sunlike stars, so maybe that's why? The procedural engine probably just needs to be tweaked. HarbingerDawn, do you remember if sunlike stars (K-F class) generated with more massive and larger jupiters? I'll see what the supergiants in the catalog stars have, blue or otherwise. Omicron1 CMa 9 is 4.6 , HD 52690 4 is 3.8 . 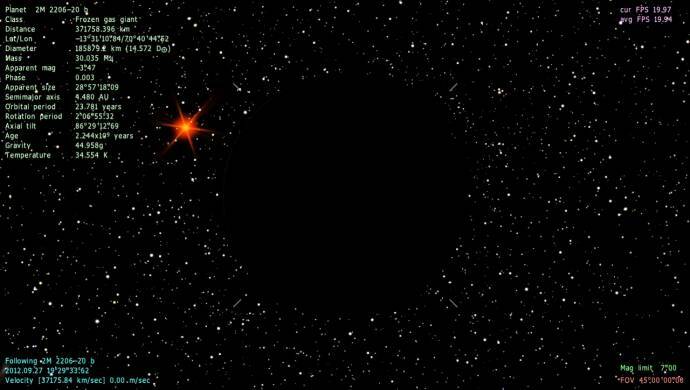 Not all of the supergiants have gas giants way more massive than jupiter though. I think so. I just tried to check but my installation of 0.95 isn't working correctly. I've check the code and indeed found a wrong limit value for the planet mass. It was 1 Jupiter mass per Sun mass, i.e. if a star has a mass of 0.8 Sun's, its planets will have a mass not greater than 0.8 Jupiter's. I made this to suppress the generation of gas giants for red dwarf stars (as it'd seen from actual exoplanetary statistics). So I need a more realistic approach. In looking at the Exoplanet app (whicn now also includes the Kepler objects if you decide to include them in the catalog in the app) and including the Kepler objects, I'm seeing that masses around Jupiter mass up to 5x Jupiter are pretty common (our jupiter may actually be on the lower end of Jovian class gas giants, but hey, it's still king of the planets for our solar system), after that, the higher masses start getting rarer. The REALLY massive gas giants (20+ Jupiter masses maybe) could be a class of really dense frozen (in some cases anyway) gas giants, or are actually brown dwarfs (2M 2206-20 b is probably one, given that the Exoplanet app diagram shows it as actually a bit bigger than its host star), or something else alltogether. Space Engineer, if you don't have it already, I would recommend the Exoplanet app and the Kepler candidates one (both made by the same person). The upper limit of the gas giant is ~13 Jupiter masses. Because this is the lower limit for brown dwarfs. This is the star mass - planet mass diagram. As you can see, Sun-like stars (1 Msol) have average planet mass about 1 Mjup (the dense blob), and smaller blob at ~1/20 Mjup (neptunes). While more massive stars have only more massive planets (this is due to observational selection - we can't detect lo-mass planets of hi-mass stars). Also, keep in mind that we actually don't know real mass for almost all planets, but only their lower limit, because we able to detect only value M * sin(i), where i is the inclination of the planetary orbit. It is usually unknown so real mass of the planet should be greater than detected M*sin(i). Only transit planets (i.e. Kepler's) have known i = 90° (because obviously we observe the transit planet from the side of its orbit), so their M*sin(i) = M.
It's still a cool app to use, even if you can't port the values very easily for SE. Anyways, I read somewhere that the lower limit for brown dwarfs was around 10 jupiter masses (or maybe that's the absolute lowest limit, no idea), but wasn't quite sure, so I went and fudged it. Right now we can't, but in the future with better techniques and instrumentation, perhaps. I've check the code and indeed found wrong limit value for the planet mass. It was 1 Jupiter mass per Sun mass, i.e. if a star have a mass of 0.8 Sun's, its planets will have a mass not greater than 0.8 Jupiter's. I made this to supress generation of gas giants for red dwarf stars (as it seen from actual exoplanetary statistics). So I need more realistic approach. Maybe something like the highest mass (in Jupiter masses) a planet can be is the square of ten times its sun's mass (in Sol masses). 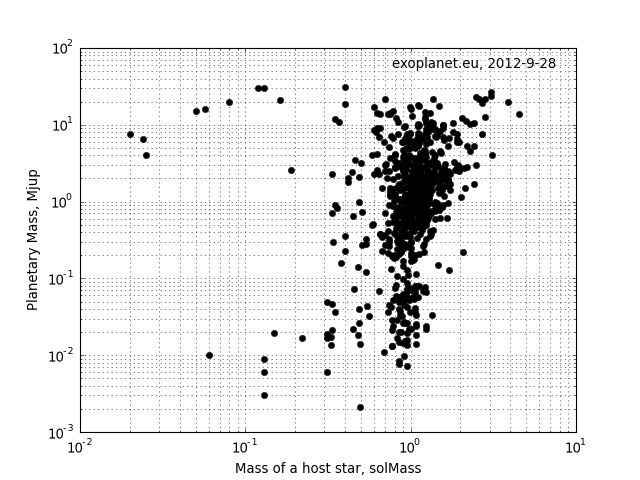 Like that, a star like the Sun can get a 10 Jupiter mass planet, but the max planet mass quickly drops at lower mass stars. Or maybe cubing it instead to make it scale down even quicker. There should be a cutoff at around 13 Jupiters though since that's around where a gas giant ceases to be a true gas giant and becomes a brown dwarf. 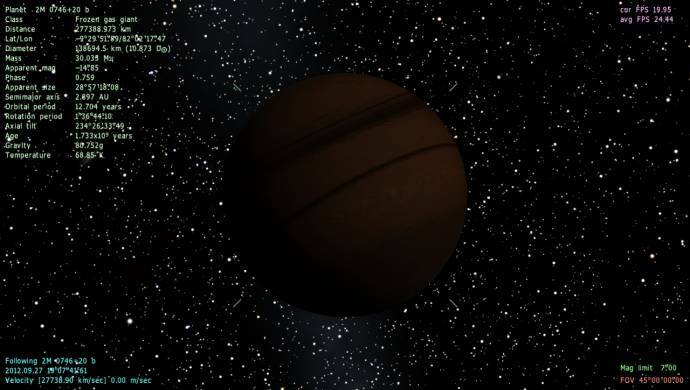 I know that we don't always know the exact mass of a planet, but I'm just saying that in the exoplanets app, there are gas giants (or objects I should say) with masses near that point, so it's really not so clear cut. I looked around a bit on brown dwarfs and there is a class of Brown Dwarf that SE doesn't use, which is Y class: Space.com link http://en.wikipedia.org/wiki/Brown_dwarf#Spectral_class_Y and there's apparently a brown dwarf with a mass of 7 jupiters (might be on the extreme end of the scale), so obviously it's a much more complex thing than just a mass limit. 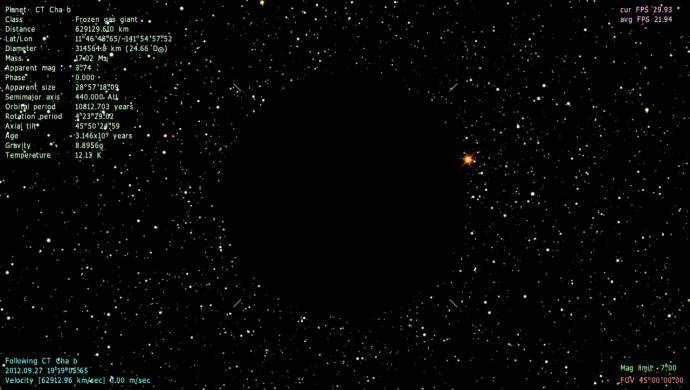 Edit: Since we're going offtopic onto the discussion about brown dwarfs, maybe we should split the topic? The gas giant in the second post is a hot jupiter with a puffed out atmosphere anyway. Well, the thing about the borders between gas giant and brown dwarf at 13 Jupiter masses and the one between brown dwarf and star at 80 Jupiter masses is that they're really human definitions. 13 Jupiter masses is roughly the point where deuterium fusion becomes possible and 80 roughly where proper fusion becomes possible, but those are not precise cut-off points, and it's very hard to determine whether fusion actually happens in the core of something. You can also ponder whether something that formed like a planet, but ended up twenty-three Jupiter masses should be called a brown dwarf, and whether something that formed like a star but ended up only seven Jupiter masses should be called a gas giant. The problem is really that nature doesn't make things in discrete categories: it just makes something, and says "I don't know what it is either, and I don't care. If you want to give it a name, then you figure it out." They are human definitions, but they are a little more objective than many definitions of other object types are. Also, I have also seen 65 Jupiter masses as the lower limit for hydrogen fusion, along with 80 (I guess more work needs to be done in this area of astrophysics). You can also ponder whether something that formed like a planet, but ended up twenty-three Jupiter masses should be called a brown dwarf, and whether something that formed like a star but ended up only seven Jupiter masses should be called a gas giant. I think that the method of formation is irrelevant, and that the intrinsic physical characteristics of the object should determine its classification. If a substellar object fuses deuterium or ever did fuse deuterium, then it is a brown dwarf. If not, then it is not. Also, I see no reason that a world can not be classified as both a planet and a brown dwarf, depending on the circumstances, though I suspect that in most cases a brown dwarf would behave in such a way (have such a role in the configuration of the system) that it would be classified as a companion object to the star, and not as a planet. Exactly. It's the same with super-earths which range right into the realm of Neptunes or ice giants. Really, the only difference between a big super-earth and a sub-neptune might be how thick it's atmosphere is and other properties that define an ice giant. Heck, a planet that has the properties of a small neptune might appear like a super-earth when it's closer to it's host star.